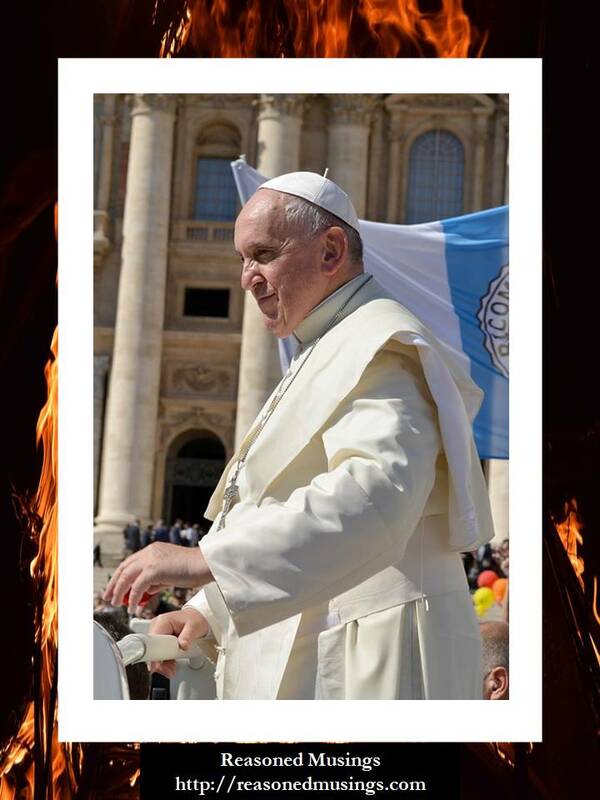 Reasoned Musings: No Hell, Pope? Pope Francis has a penchant to be embroiled in controversies. In an interview published on March 28, 2018, Pope told his longtime atheist friend, Eugenio Scalfari that there is no hell. He also claimed that the condemned souls just disappear, “In another interview with his longtime atheist friend, Eugenio Scalfari, Pope Francis claims that Hell does not exist and that condemned souls just "disappear." This is a denial of the 2,000-year-old teaching of the Catholic Church about the reality of Hell and the eternal existence of the soul. This, apparently, is the transcript of Pope Francis’ interview with Scalfari, “Scalfari says to the Pope, "Your Holiness, in our previous meeting you told me that our species will disappear in a certain moment and that God, still out of his creative force, will create new species. You have never spoken to me about the souls who died in sin and will go to hell to suffer it for eternity. You have however spoken to me of good souls, admitted to the contemplation of God. But what about bad souls? Where are they punished?" Whether the Pope believes in hell or not is not the matter at hand. Hell, if it exists, would not cease to exist just because Pope Francis does not believe in it. We believe a loving God would not send HIS children, even under the pretext of unbelief, to eternal torment. How would a loving parent gift his child with prolonged suffering? Would the parent not do all within his means to prevent this horrendous occurrence? This is our painful dilemma. In other words, we question the credibility of God’s love with respect to hell. True love respects and educates, but never enslaves. A parent who truly loves his child will educate him of good and evil. A parent will do “everything” within his power and will to stop the child from pursuing evil, but that “everything” excludes enslaving his child. If a child is bent on pursuing the path of evil, the parent will choose preventive actions, but will never imprison the child into solitary confinement. The circumstantially handicapped parent may opt to allow the child to have his way; this is the respect the parent shows to the disobedient child’s cognizant volition. A defeated and emotionally fatigued parent will allow the child to continue in willful disobedience. Nevertheless, the parents’ love for the child will never diminish even if the child willfully rebels to disobey. The father of the prodigal son not only heeds to the property share request of the son, but he goes a step further by not preventing his son from departing to a distant country with his share of wealth (Luke 15:12-13). The son willfully disobeys the loving father, and departs. The loving father expectantly longs for his son’s return and when he does return, the father rushes to welcome the son even before he repents. This is father’s love. A parent’s love will never cease and always hope for the best, but at the same time, a parent’s love will respect the child’s conscious decision. Let’s travel back to the creation account in Genesis. God placed the tree of the knowledge of good and evil but commanded Adam and Eve not to eat of it (Genesis 2:9, 16-17). Even though it was a command, Adam and Eve were given the freedom to accept or reject God’s command. Thus God exhibited true love, and HE desires mankind to love HIM. True love can only exist in the conscious reality of freedom. Freedom to accept or reject the lover is intrinsic in true love. Therefore, God’s love for mankind warrants the presence of heaven and hell. God’s justice can also be questioned with respect to hell. How can a just God eternally punish HIS children for the sin of unbelief committed during the specific period of time of their existence in this world? Isn’t the eternal punishment disproportionate to the sin committed in time? This is another painful predicament we struggle with. Human life was designed to be with God unto eternity through mutual love. Sin separated man and God. God, in HIS foreknowledge, designed a way out of this predicament through the one time sacrifice of the Lord Jesus Christ. HE has also done everything for mankind to believe in HIM, so mankind will be without excuse against God. When man refuses to believe in Christ and thereby rejects God, God simply allows man to be away from HIM unto eternity. In other words, the creational intent is an eternal fellowship with God or an eternal banishment from God. Mankind makes the choice, and God honors that choice. This is Justice. Therefore, God’s justice warrants heaven and hell. Evil people prosper in this time and age (cf. Psalm 73: 3). If evil people prosper, the weak and innocent would suffer deeply…When evil rules, evil would be the superior moral. If there is no consequence for evil deeds i.e. if there is no hell, good cannot be the superior moral (good need not be stronger than evil). If evil rules over good, evil would be the sole standard for life. Hence evil will pulverize the good. …If evil is sovereign, this world would be amoral (evil would be the only superlative moral). Wouldn’t morality cease when the right-wrong moral distinction is erased? …Predicated on the fact that life is more valuable than materials, it might be of less significance to the victim and the society if a thief who robbed a pen was not convicted of his crime. But it is of a great significance if a murderer of a child remains unpunished for his crime. The thief who habitually steals pens could progressively deteriorate into robbing millions. During this progressive deterioration, the thief could also become a killer. Thus the possibilities for the lesser evil to transform into greater evil are endless…If evil rules, violence would be rampant and peace would cease, for the world we live in would be amoral. A world without hell could only be postulated under the condition that God does not exist i.e. an atheistic paradigm. It is very reasonable for evil to prosper and justice and peace to be non-existent in the atheistic worldview. The atheistic paradigm would not (or cannot) offer any reasonable or logical answers to the problem of evil. Such is the moral bankruptcy of atheism. Ask an atheist to explain the presence of evil. More often than not, they would quote Richard Dawkins in his work “River Out of Eden” and say “there is no such thing as evil.”…So an atheist who denies God’s existence will deny evil and will deny hell. He has no other option. So if there is no hell, there is no god. 1. Evil would be unpunished. 2. Evil would be sovereign (rule over good). 3. World would be amoral. 4. There should be no God (for hell is only plausible if God exists). But this is the existential reality…We are not living in a world where evil is sovereign. We are living in a world where God is sovereign. Although Satan is the temporary ruler of this world, the sovereign God is in total control. We know that God is in total control since our world is not amoral. There are punishments for evils. Evil does not rule over good. Good still rules over evil. This is precisely why a good number of people enjoy a rather peaceful existence. The presence of God entails peace. God has temporarily allowed evil to reign. But HE has assured us that not a hair from our head will perish. God is good. God does not tolerate evil. If we repent of our sins, believe and remain in the Lord and Savior Christ, we will be saved. Those who do not believe in Christ remain evil, since their sins remain unforgiven because of their conscious rejection of Christ. Such an evil person sins against an infinite God. Sins against an infinite God mandate an infinite punishment in the form of hell. Hell then is the eternal abode of all those who reject Christ. In case you have not received Christ yet, please pray and receive the Lord Jesus Christ as your God and savior. I pray that you repent of your sins and ask Christ to forgive you. The merciful and loving Lord will forgive you and you will be with God forever and ever. I pray this in Christ’s name. Amen. Websites last accessed on 6 April 2018. This is a remarkable article! When I first read what Pope Francis said I was too surprised. The thought of hell not existing did not cross my mind. Like God put 'the Tree of good and evil' in Eden there also has to be heaven and hell. Its the basic formula of existence, I feel. God punishes the evil because they take it upon themselves when they chose to commit wrongs. Their saving is in their hands.